ANOTHER rainy day!!! Of course, yesterday when I was teaching, the sun was shining and the temperature reached 70 degrees! Today it has rained off and on all day. Oh well, I've taken good advantage of it by working on my Photoshop class homework. 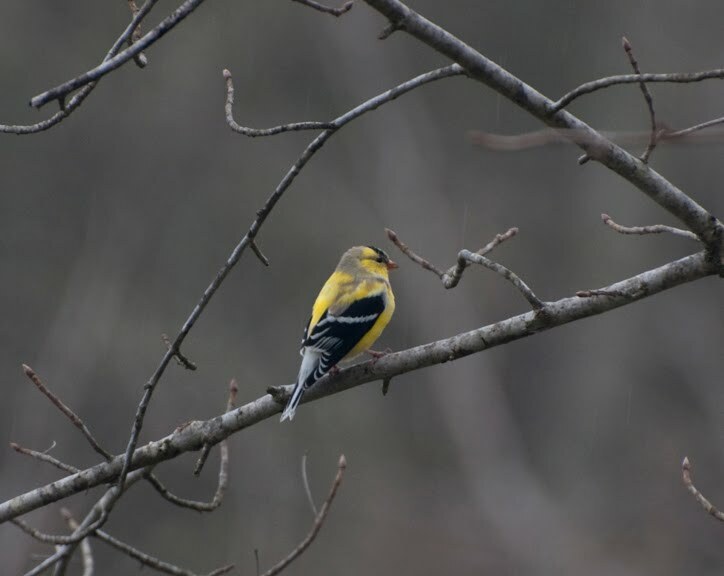 I got a kick out of seeing this male Goldfinch in his springtime "transition" plumage. He is in the process of molting his olive-drab winter feathers for his brilliant yellow "looking for love" feathers. He should be ready to attract a female very soon! :) I wish he had been a bit more cooperative and turned my way. I remember my grandparents in Indiana calling these birds "wild canaries" when I was little. I love to tease the boys in my nature classes that it is the male birds who "put on the make-up"! I once made the mistake of saying that male birds are "brighter than females", the boys' response was, "Yeah, we know that!" So I had to rephrase my comment to say that they are more brightly colored!